Hello! If you were wondering why this sudden burst of Spanish, we have news! We just launched Avaz Spanish. Partly because we love saying Hola to each other, but primarily because we received a lot of interest from the Spanish-speaking populace. Avaz Spanish comes with a vocabulary of 5000+ words that has been localized to Latin American Spanish. For instance, you will find that in categories like food, restaurants, sport, religion etc the words are specific to Latin American culture. More of football, less of baseball. – It’s quicker to customise: In Avaz Spanish, you can add, copy, paste and delete many items together, making it even easier to customise. – It sounds great: Avaz Spanish comes with new and improved voices from Ivona. These voices have been rated the best text-to-speech voices in many independent studies. – It’s touch sensitive: With better touch response, Avaz Spanish will be much more usable by children with fine-motor problems. Avaz Spanish also works with iOS7 switch control. – It grows with the child: The morphology option for verb and noun forms ensures that your child’s language development doesn’t stagnate. – It predicts: The prediction option on keyboard mode makes sure you never misspell. You can also choose to make word predictions appear after a delay, for finer control over prompting and fading of predictions. – It comes with a Settings Wizard: When you start Avaz for the first time, it asks you a few questions and automatically sets up Avaz for your child with the most appropriate settings. – It offers great support: If you need help within Avaz, you can chat with us directly from the app. So here’s the link to try it out. It’s absolutely free. 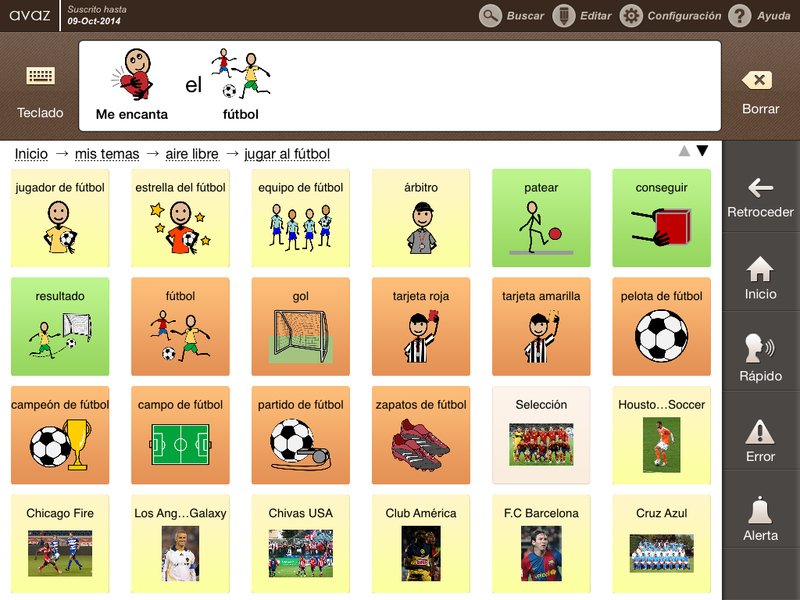 And if you have a Spanish friend in need of an AAC app, share this link with them.